Step 1: Building the Body "Recycling Old Pallet Wood"
In this project i'll show u how can we build a cool very cheap Aquaponic system from recycled materials. this aquaponic system will contain a planter for growing fresh food without fertilizers, a fish tank to grow healthy fish. fish would eat food then fish wastes would be transferred using water pump to fertilize plants in the planter after that the water will be filtered and cleaned then return again to the fish tank. this cycle would save water and grow up fish and plants with no costs. 1 / 6 • We would bring some used wood pallets. 1 / 5 • Add 4 cubes to the buttom , place 2 ( 30 cm ) on the cubes and place 3 ( 70 cm ) bars on the top of small wood bars then use bolts and hammer to fix them. 1 / 4 • Place the fish tank (65 cm x 30 cm ) on the lower base then fix the last corner. 1 / 2 • Now it's time to pain our project (I use wall paint and brush). Building bell syphon to drain water. 1 / 14 • Drill a hole in your planter just to fit the water pipe. 1 / 5 • Out a submersible pump inside the fish tank. Here I'm using 45 watt pump that can rise water up to 2 meters. For feeder, I used DC motor and fixed a screw on its shaft so when it rotates, it rotate the screw and make fish food fall in the fish tank. Test the rock to check if it can be used as media or not. 1 / 4 • Get some rocks and wash them well with water. Here I use river rocks. We need almost all the pins on the Netduino board to complete this project. Follow Netduino pinouts and schematic below to correctly wire eveything. 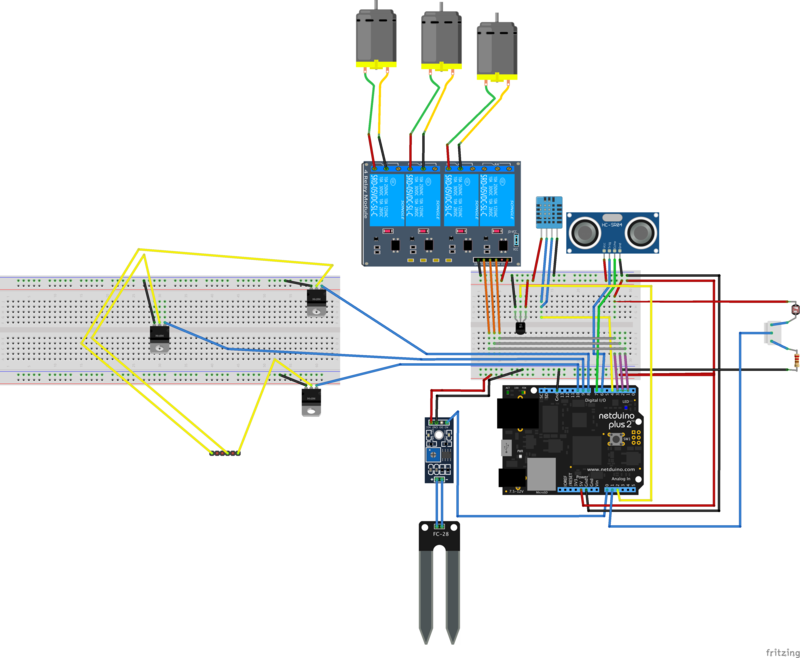 This is the schematic for wiring everything. Download and install the latest version of Visual Studio for Mac. If you don't have it installed, click install. Once installed, go the the Installed tab, and ensure the extension is listed and enabled. The Netduino board should send sensor readings (temperature, humidity, sun light brightness....) to Firebase and receive actuator (red, blue, green of LED strip, pump state, feeder state, and heater state) values from it to make action (switch relay on or off). The mobile application change the actuator values and read sensors values. Simply follow this link to know how to set up AR mode. NOTE: Package name on EasyAr cloud should be same as package name on Unity app and Firebase package name, or it would show invalid key error !